Connie Holley Storey seen next to tee-shirt fundraiser, "Connie Strong." UPDATE 09/21/17: On September 8, Connie Storey, 62-years old, was savagely attacked by her son's pit bull after she went outside to feed it. According to the dog's owner, Josh Storey, the animal had also attacked him previously. Connie suffered life-threatening injuries that led to the amputation of both of her legs. But Connie was a fighter; she amazingly survived another 12 days before succumbing to her grave injuries. How do her family members feel about pit bulls now? Marty Holley, who claims to be Connie's brother, left several disturbing comments on the WTOK article. "The family does not blame the breed," he said, and falsely blamed the vicious attack on rabies (pipe dream). He then proceeded to spell out the "normal" attack manner by pit bulls in cases of serious and fatal maulings, claiming it was abnormal behavior of this dog. 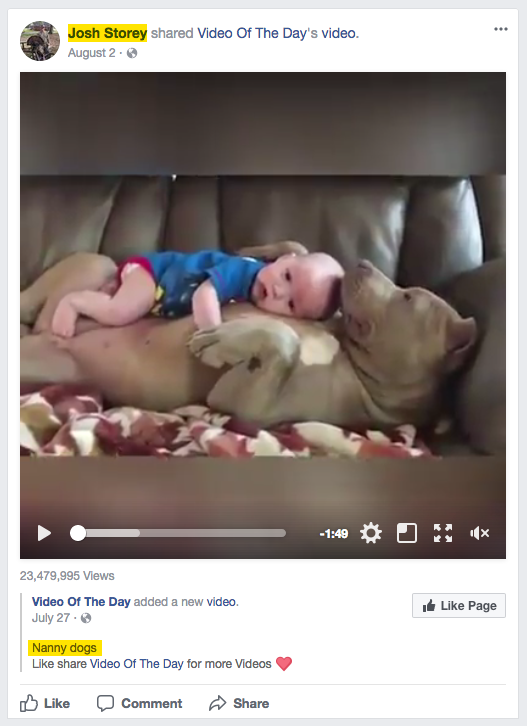 Marty should read up on how pit bulls execute the killing bite and frequently rip out their victim's throats. 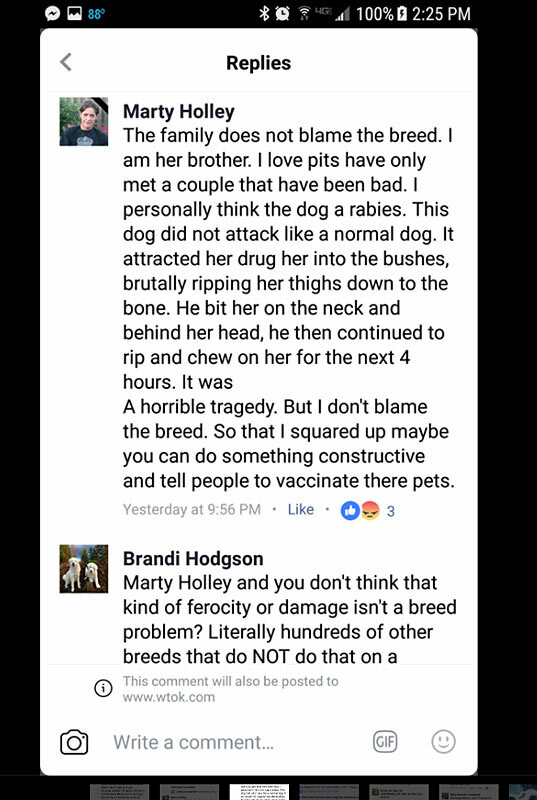 One can see that even after a pit bull attacks two family members, and in one of those cases caused death, pit bull lovers like Marty continue to defend the breed and invent false stories to excuse away the behavior of a dog selectively bred to fight to the death in a pit. This is after a family pit bull killed his sister. 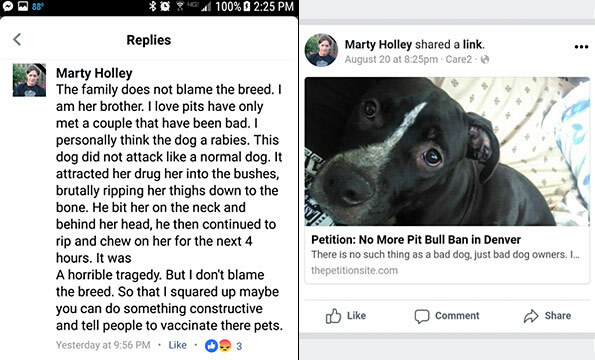 Finally, Marty is yet again another "exhausted cliché" pit bull owner for signing (as a non-resident) and spreading petitions opposing pit bull laws in other jurisdictions. Neshoba County Sheriff Tommy Waddell confirmed to WTOK that 61-year old Connie Storey died from injuries sustained in a pit bull attack Wednesday morning. She had been hospitalized since the pit bull mauling on September 8. The vicious attack occurred in the Beatline community as she was feeding the dog at a home on County Road 276. The sheriff also confirmed the animal belonged to Storey's son. The pit bull has since been put down. No charges have been filed. Connie had several sons. It's clear by reading through public Facebook comments that Josh was the owner of the pit bull. The dog had also attacked him before. The day after his mother was brutally mauled, he was asked, "Was that the same dog that attacked you?" Josh responded, "Yes." Then apparently, he shot the dog twice after it attacked his mother, killing it. It's too bad this aggressive pit bull was not put down after the first attack. Connie paid the ultimate price for this. Philadelphia, MS - Earlier, a person sent in a notice about woman who passed away today after being severely attacked by a dog September 8. Just hours ago, the Neshoba Central High School Class of 1973 Facebook page confirmed that Connie Holley Storey did not survive her injuries. "Please be in prayer for the family of Connie Holley Storey. Connie passed away this morning." The post also states that she had remained in critical condition in Jackson following the attack. 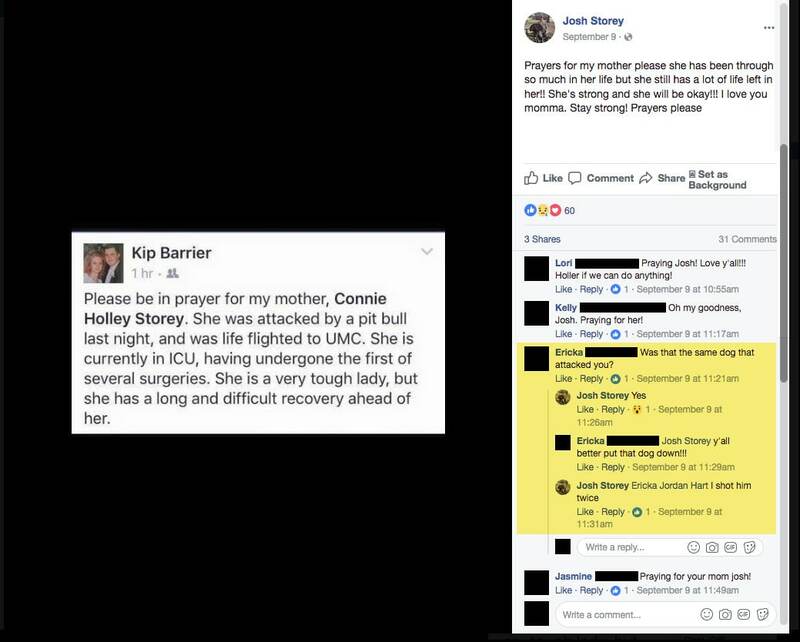 One recent Facebook post states that doctors had to amputate both of Connie's legs. Another post states, "she has many surgeries upcoming and a long road to recovery." 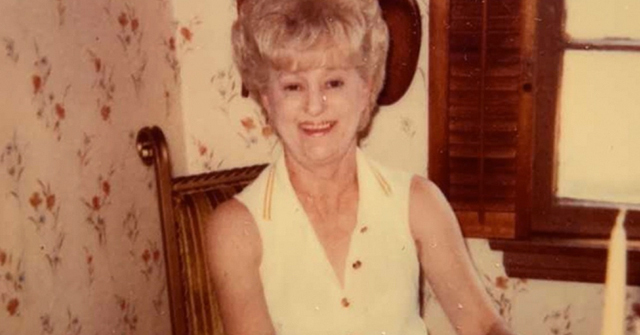 One person posted a photo of Connie: "Rest in peace mama Connie Holley Storey i love u so much." Other posts acknowledge her death today. Just several days ago, the Scarbrough family started a fundraiser to help pay medical expenses. 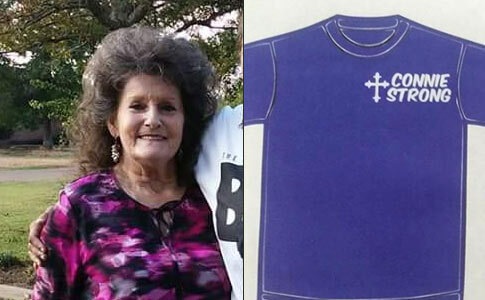 The tee-shirts are titled, "Connie Strong" with a prayer on the back. What appears to be true, through the tee-shirt fundraiser and various Facebook posts, including by her daughter, is that people were anticipating her survival. We know that she fought hard to survive for 12 days. 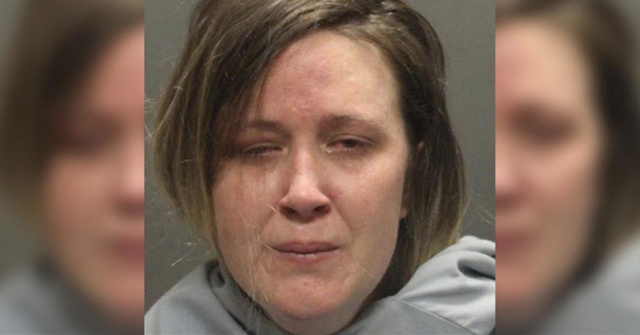 Multiple amputations after a violent dog mauling is a grave prognosis for any person her age. We expect to see local news reports about Connie's death in the next several days. We hope that family members or friends share what happened with local reporters. 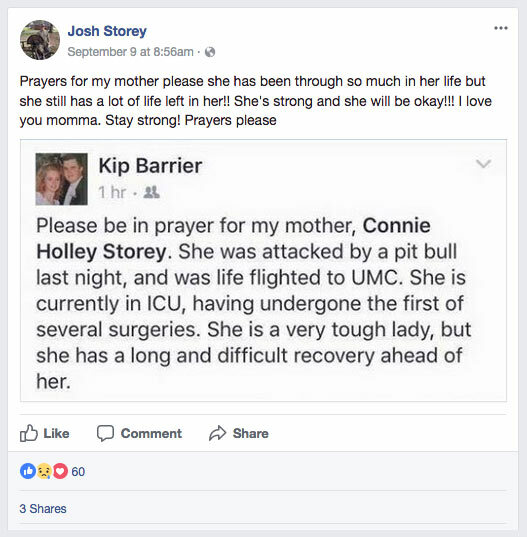 The person who sent the notice into DogsBite.org said that Connie was attacked by her son's pit bull. We are working to confirm this, though it is apparent on Facebook that multiple male relatives own a pit bull. One of these dogs is shocking, possibly game bred, and should be named Satan. Karen Storey comments, "Good Boy! Just dont turn your back and ... if he doesn't know you ... BACK OFF! Wouldnt be the 1st time he's tasted blood. If he knows you ... No Problem." [sic]. You killed your mom, son, will it be enough to make you put away the pit bulls? Sadly, probably not. He's probably telling his buddies that it was a "freak accident". Since it was his own dog that killed his poor mother, he can't very well blame the OWNER, now, can he? Holy cow, did anyone else gasp when the picture of the pit bull loaded? Yikes. Even though I was alerted to the truth about pit bulls more than a year ago, it still boggles my mind and shocks me that people are getting so severely attacked and even killed by DOGS. I grew up with dogs who were loving companions and didn't kill things (none of them were pit bulls, of course). I love dogs. These horrific maulings just don't make sense to me. This poor lady. May God bring her family peace and comfort. What a terrible tragedy. Former dog lover here. 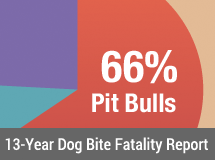 The increasing prevalence of dangerous dogs like pits is one of the reasons why I changed my mind about dogs. These days, I'm very wary of any dog, even the little ones. Why? Because of what happened to me last January. I was walking along, minding my own business, when a dog bit me. The owner's response? She baby-talked to the dog about how naughty he was. THEN she spoke to me. I'm becoming all the more convinced that too many people have dogs for the wrong reasons. Many of these people do NOT know how to interact with people, and I think they need to spend more time working on that than immersing themselves in their doggie-dog world. Charges need to be filed against the dog owner who knew this dog was aggressive/a biter. He will probably not be charged because he is related to the victim. He should also be sued by her health insurance company and/or the hospital for all medical charges. BSL protects people from their own stupidity. Ban the breed, no more deed. There is no need for pit bulls. YQN: I agree, I've never seen so many utterly clueless idiot dog owners as their are today, people who don't leash even where there is a leash LAW, people who have a 'beware of dog' sign posted on a 40 INCH fence, people who leave the dogs in the back of the pickup truck unsecured while they're in the store or drive around with the dog hanging halfway out the fully retracted car window. Just plain STUPID. And they ALL think THEIR dog doesn't bite. T-shirts should say "Connie strong" on the front and "Pit bull STUPID" on the back. EyesOpened: I didn't gasp, but my first thought was that I didn't know that a dog could look evil. That thing was scary looking. I generally like dogs and have two that are friendly and gentle, but I don't understand the appeal of fighting dogs. I wouldn't want a dog I'd have to worry would hurt someone. 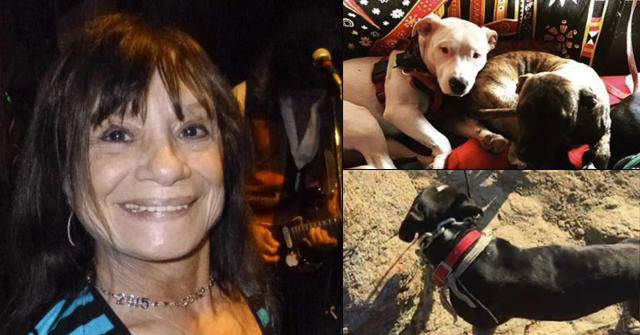 We just made an update to this post about Connie's pit bull defending brother. Garnet, I agree. I've always liked having dogs that were sweet, cute, gentle, friendly, etc. My family has never wanted dogs for protection or intimidation. They are our companions. Even though I've always adored them and considered them as family members, they do have a proper place (below humans) and no aggressive behavior would be acceptable. I wonder if people today are swallowing the lies spread on TV about all dogs being able to be rehabilitated. I also wonder if we're seeing more aggressive events from dogs due to the popularity of aversive training methods that simply suppress problem behaviors and that can lead to aggression. 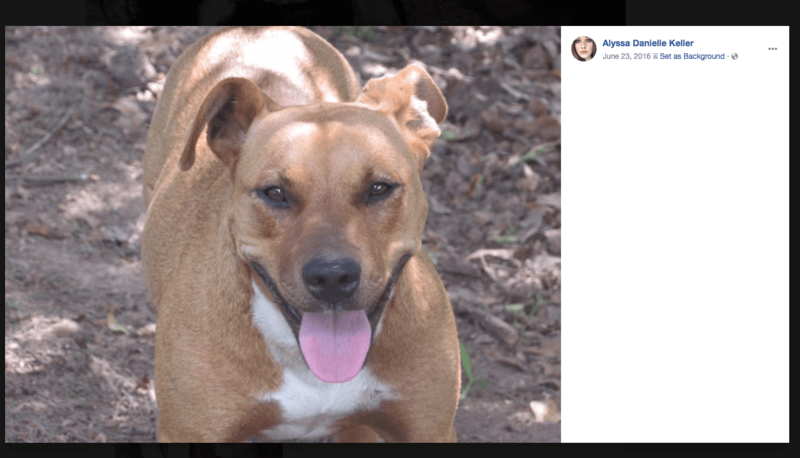 "Of course, those coming to the defense of those dogs, and those like them, insist that the breed background of the mutt perpetrators had nothing to do with it. Indeed, it was just something that happened. Like having it rain on your birthday. The fact that the dogs involved had the capacity to tear the legs off somebody was merely a coincidence. Hey, she could had her legs cut off by a goldfish, right? To EyesOpened and others. We were unable to find a photo of Josh's pit bull on his Facebook page (he may have scrubbed them after the attack). But we did find one on his ex-girlfriend's page. The two were dating when this photo was taken. She does not own pit bulls (to our knowledge), but owns normal dogs, the kinds that do not maul or kill people. Eyes Opened. Yes, you are correct. The public gobbles up the 'magic rehabiliation' swill like pigs at a trough. They believe that all dogs, if loved and rehabilitated enough, can earn a Canine Good Citizen thus demonstrating the marvelous healing powers of 'rehabilitaion.' Trainers use words such a 'reactive,' 'prickly,' 'does not play well with others,' or 'poor impulse control' telling the owner that Bitsy only needs training to become a sterling addition to the neighborhood. Trainers who refuse to use such euphamisms and do not offer 'Reactive Dog Classes' cannot compete and lose business to trainers who do. Trainers who do not follow the party line that these are only misunderstood dogs who can all be rehabilitated risk anti social media campaigns from the we love pits crowd. Sue Myles, thank you for the insight. I imagine it would be extremely difficult to be a dog trainer in today's current climate. I've noted with interest the arguments between opposing camps of dog training methods and continually see an attitude and beliefs reflected in those who are devotees of trainers like Cesar Millan: they claim that positive reinforcement trainers can't rehabilitate truly aggressive dogs like he can and instead just have them euthanized or are unable/unwilling to take the worst cases. Then they gleefully expound on what kinds of aggressive killer dogs he's magically "saved" from death. It's incredibly distorted thinking, based solely on heavily-edited TV shows and charismatic, sentimental pseudo-science babble. I wish I knew how to change the industry and these lies. Yes, it does seem that people are more likely now to try to 'rehabilitate' dangerous dogs than they were a few decades ago. It really doesn't help that celebrity dog trainers act like keeping and 'rehabbing' a large aggressive dog capable of maiming or killing a person is a noble thing. It's crazy. I generally like dogs, but can't imagine valuing an aggressive dog over people, or choosing a fighting breed for a family pet. Having pets should be a source of pleasure, not stress and grief. "I personally think the dog a rabies"- wow, real 90 IQ geniuses there. Have you ever noticed how NO pit bull owners can spell or write correctly? They often have a string of bad decisions (other than choosing to own a pit bull) in their lives as well. It's incredibly sad. While the pit pushers preach this narrative of the misunderstood, marginalized, mistreated (but loving and loyal) dog, those who choose to own them are usually a bit on the fringe of society themselves and end up over-identifying with these dogs. I have been a dog trainer for forty years. The current fad of rehabilitation,'saving' dangerous dogs has ruined what used to be a marvelous career. Now, when I get an email from someone with a dog that would have been euthanized twenty years ago I must tread carefully to avoid entangling myself with the owner. To refuse to train their beast, and yes owners drop leashes, has gotten me the only two negative yelp reviews. These owners have been told by so many, especially the television trainers who are pure narcissists, that their Poopsy can be trained to be a sweet angel are the first to be offended, outraged and get on anti social media. The whole training game has become a nightmare thanks to the swill that the public had been fed. Sue Myles, that's terrible! I hope that you're still able to be successful and help those you can. The complete sea change in thought has been stunning to watch. Keep fighting the good fight.